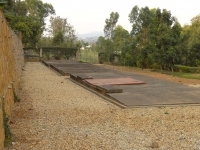 Mass graves in Rwanda. Photo by Adam Jones. While it is undeniable that science and technology has improved the living conditions of many, it is patently misleading to imply that, due to these developments, modernity has somehow “triumphed” over the spiritual and religious legacies of our past. And yet this is precisely the suggestion of some of the leading voices in social science. Basing their claims on so-called hard science, such as the evolution of genes and the cleverness of cognitive adaptation, these apologists for industrial Western values put forth platforms that vilify traditional religions (e.g., Harris, Hitchens), that dismiss nonreductionist science (Baker, McFall etc. ), and that sharply dichotomize “civilized” (e.g., modern industrialized) from “uncivilized” (e.g., traditional, Middle Eastern) cultures. But in my view these apologists are far too hasty to assume the mantle of authority, and their own presumptuousness (read polarization) is concerning. Take Steven Pinker’s new book The Better Angels of Our Nature (2012). This work is meticulously composed, packed with data, and rife with statistical analyses. The problem, however, is that it is oversimplified. Pinker’s thesis is that the contemporary world, and in particular, the contemporary “developed” world, is far more peaceable than its preindustrialized predecessors. In the contemporary “developed” world, Pinker (2012) notes there are markedly fewer homicides per capita than there were even a hundred years ago. While all this may be true on a statistical basis, and Pinker certainly deserves accolades for his command of calculations, it is greatly misleading to then go on and imply, as he does, that the modern industrial world is somehow inured to the violence of the past. This can be contradicted on the basis of horrific recent wars (e.g., in Iraq, Afghanistan, the Balkans, and Rawanda), heightening class divisions in the most industrialized nations, and the ever-present potential for unprecedented global destruction. And let us not forget the “stench,” as philosopher Richard Rorty once intimated, that still looms over the death camps and killing fields of just over sixty years ago. Indeed, regardless of its per capita mayhem, the 20th century was probably the bloodiest century in terms of pure numbers than any other century on record. Moreover, these records of overt destruction, do not even touch the problems of skyrocketing rates of depression and suicide in our own “advanced” era. Therefore, before we sever ourselves from our bestial past, let us not underestimate the ongoing outrages of humanity. We are making headway with our technology, our practical cleverness and our wits, but our spiritual and emotional constitutions remain at a dangerously precarious level, and we ignore the “better angels of their nature” at our peril. Author’s note: A number of these ideas are further explored in The Polarized Mind: Why It’s Killing Us and What We Can Do About It (University Professors Press, April, 2013).